Today marks 30 years since “The Empire Strikes Back” was first released in theaters. I am a HUGE fan of Star Wars – just ask anyone who knows me. The thing is – I don’t actually remember going to see the original “Star Wars” in theaters. I know that I did, but I don’t remember it. 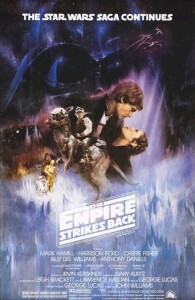 I do remember going to see “Empire Strikes Back” – almost like it was yesterday. For many people who grew up in the 60’s, the seminal cultural event in their lives was Woodstock. It helped (whether for good or for ill) to define a generation. I would argue that the same holds true in many ways for “Star Wars”. For those of us who came of age during late 70’s and early 80’s, it remains a cultural touchstone unlike any other. Not only were the original three films a piece of cinematic history, they also impacted the broader culture in ways I don’t even think George Lucas could have imagined. As I said, “Empire” is the first of the “Star Wars” films I remember seeing in the theater. I can remember standing in line, outside the theater with my Mom and little brother, waiting to get in for the screening. As the show before ours let out, I can recall a man walking by the line and telling my mom that she should reconsider taking us to the show, because – “Luke gets his hand cut off”. First off, I was disappointed that he spoiled that part of the story, but more importantly – I was afraid my Mom would heed his warning, and take us home. Evidently she found him to be as much of a dolt as I did, because she summarily ignored him and took us on to the movie. To see those characters alive again on the screen, at that time, was magical. Even though I now knew that Luke was to lose a hand – I didn’t know how, and I couldn’t wait to find out. 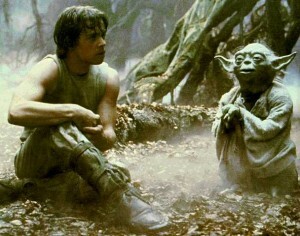 Just like everyone else in the theater – I was enthralled with Yoda, I was convinced Han was dead, I thought Boba Fett was cool, and I was consumed with two questions – who was the other that Yoda referred to on Dagobah, and was Darth Vader really Luke’s father? For the next three years, all my friends and I could talk about were these two questions. Who was the other? Was it Han? Was it Lando? Was it Leia? 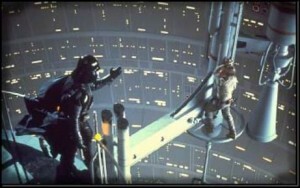 And could Darth Vader REALLY be Luke’s father? Of course not – no way – although….maybe? I can’t remember any other time in my life when I was so consumed with things that happened in a fictional world. Even with all of the books and movies and I seen and read since then, nothing has ever quite captured my imagination in the same way “Star Wars” did.